I've only used it for terrestrial viewing so far. It has the PGIII and BB coatings. A few comments. It took months of waiting--delivery time kept being put back yet another month. Communicated with the Jims at Questar quite a bit. When I finally got my order, one of the eyepieces was bad (Brandon). Jim said when I described the problem he knew exactly what caused it--the lens had somehow been installed too tightly or some such. I returned it and another is on the way. (Why didn't the exquisite Questar staff test it before sending it to me???) I mean, this is the RR of telescopes right?. Jim R. actually kept stressing that during one of our conversations. The manuals sent with the scope were vague, confusing and out of date in a lot of ways. Some parts sounded like it was written in the 1960s. A couple of very key nuggets were omitted when it came to setting up the hand-held device for the PgIII which had me angry and frustrated, so much so that I was getting ready to send the whole thing back for a refund!!! The hand controller device is configured for future models that don't pertain to my configuration, and if they had bothered to at least put a note in with my order, telling me just a couple of key settings, I would have had NO problems. As it was, the drive appeared to not work at all, and I was getting a bit miffed. I finally got things going after walking through on the phone with Jim P. So now all is cool. Haven't gotten it under dark skies yet, but hope to soon. I guess it remains to be seen. The thing is a joy to just look at, and another joy to be able to carry around like a book or something. As far as the actual viewing quality,. my eyes can't really see much difference between the Q and its Brandons and my old C-8 and its eyepieces. I guess I'm rambling a bit, but I can only say it is worth it if you can spare the money and want one for whatever reason. The guys at Questar are ALWAYS available by phone, and that means a lot. They also do seem to want to please the customer (wise policy, considering the prices), and Jim R told me that they will always be there to provide even after warranties expire. One other thing is, I would not have expected to see ANY speck of debris on a mirror in the tube, but there are a couple. It really doesn't affect the scope performance but I was a little surprised. I also have a $180 c-90 Celestron and for the life of me cannot spot a speck of anything on its mirrors. Wow, I've gotta say, that is one heck of a debut post! Welcome to CN and thanks for the insights. New or not, ANY Questar is an instant classic. Just an FYI - you may want to pop over to the "Questar" forum. Sorry to hear of the troubles, hope it all works out to your satisfaction. I doubt you pay $6K to get a good 3.5 inch scope. I'm guessing you pay that for the name, and the quality and workmanship. A long time ago, I had the privilege to be the caretaker for a 3.5 Questar Standard and got to compare it directly with my rather inexpensive Meade ETX 90/EC. I really didn't see much if any difference. If they were my Bordens (Benjamins for my American friends), I'd buy the ETX. I attempted some terrestrial viewing with my TEC6, did not like it at all, my conclusion for terrestrial viewing; I definitely prefer a scope with no central obstruction, meaning a small refractor. As for the price tag, no it is not worth $6K, not to me, paying three times the price of a TEC6, just my personal opinion. If it performs well then it's worth it! My Q is outstanding and worth every penny. Enjoy it! Questar optics are excellent, but you don't buy it just for that. There are scopes with better optics in that price range. When you buy a Questar, you are buying the whole package. A complete, portable observatory in a very compact box: A permanently collimated finder that uses the main eyepiece and has its own solar filter, a flip-in barlow, an extendable dew shield, a tripod that's easy to polar align, a solar filter, super smooth and easy to use slow motions, a great clock drive, usable setting circles, beautiful constellation and moon maps, and a camera port. Everything you need in a well-organized, high-quality box that fits in an overhead bin, or a backpack. Every control within easy reach, and with operation so seamless and mechanically solid that the scope basically gets out of your way so you can just observe. No second box of eyepieces and accessories, no fumbling in the dark, no lengthy alignment process if you accidentally unplug it, no hassles. Sets up and tears down in under five minutes -- doesn't strain the back or involve moments of panic and risky gymnastic moves as part of the process. You're also getting a work of engineering art that proclaims quality, and is a pleasure just to look at, even when the sky doesn't give you anything to look at through it. And they last basically forever. The reason we talk about them here in the Classics section is because there are 50 year old examples that are just as enjoyable to use as the modern ones. People tend to take good care of them, and Questar services any of them. How many other scope manufacturers will still service a product from half a century ago? How many are still in business after that long? Somebody has to buy them new, or else the company would go out of business. So good for you that you are supporting this classic telescope company. Others here will be happy looking for older used ones that cost a third as much, in part because they appreciate the provenance and history of scopes that were built when they were young or before, and are willing to put up with some wear and tear. Congratulations on joining the Questar owners club! And as someone here noted, there is a separate forum just for Questar discussions where you will find many more threads of interest. Amen... enjoy your new scope! In the late '50's, when I first became aware of Questar, it was a superior telescope mechanically and optically. Over the next couple of decades optical design and fabrication advanced to the point that Questar is optically routine. But the mechanical design and fabrication is still superior to most of the consumer-grade scopes on the market. And there is an aesthetic satisfaction in using an instrument like that. That is why you buy a Questar. Wow, wasn't expected such a response. Thanks, all were good and worth reading. One thing I will add is that I also purchased a Meade 12" cat last fall. When the thing arrived, I immediately learned that the declination lock knob was completely inop! Scope would fall in down position in the fork and could rest no other way. IOW, this was a completely useless telescope and I had to REPACK and send it back. What a hassle. Neither the dealer nor Meade even bothered to check on this most basic of function before shipping to me. Is quality control this bad nowadays?? I will never even look at another Meade just on this experience. Edited by TheGuppy, 10 April 2019 - 06:11 AM. I did a side by side and it was obvious which scope was the Questar. The start test, no contest and high magnifications the Questar was sharper and better contrast. But then again, I'm not the average observer. In what way was one of the eyepieces "bad"? Hi Guppy, and welcome here to the Questar Forum! Congratulations on your new Q. I purchased mine last summer, and I've been loving it ever since. A lifetime dream finally come true for me. I'm sorry to hear of all your troubles - but you certainly have seen the excellent customer service provided by Qiuestar. It is indeed too bad that you had to have the difficulties in order to experience it, though. While I have used my Q a tiny bit for terrestrial viewing, I find that it is simply superb for astronomy. Get yours out there under the night sky, and let us know what you think! It had an obvious flaw in that I could not get a good clear focus in the center of its field, and when I would rotate the eyepiece, I could see kind of dark, but partly transparent, spotting in the area. I thought at first it just needed a good wiping, and wiped gently with lens cloth, but nothing got rid of it. Edited by TheGuppy, 10 April 2019 - 09:42 AM. I own a "used" '69 standard 3.5. I also own a Meade ETX 90. Over the years , I've probably owned at least six or more etx scopes- all were fantastic optically. If anyone tells you that the Questar is "light years" ahead and above an etx 90- they either had a "rare" bad ETX 90 or don't know what they are talking about. The real selling point of a Questar is the build quality of the rest of the scope. Questars= no plastic, Meade ETX+ alot of plastic. I can have twenty people look through both a Q-3.5 and a ETX 90 and most of them can not tell the difference between the views. Some of the ETX 90's actually had better views than some Questars that I've looked through. Questar hit the nail on the head by building a "complete quality package" while Meade just succeeded in building great optics in the ETX line. 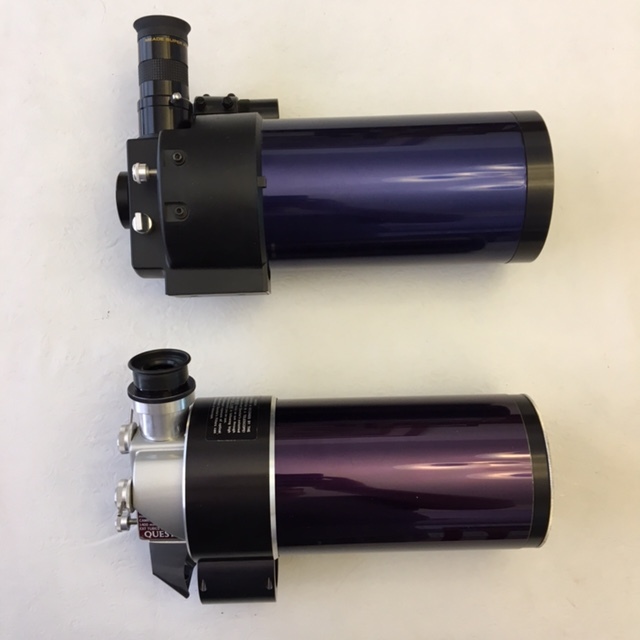 I, think Questars are great scopes but personally don't think they are worth the kind of money they sell for- when new. You now own a Questar- "enjoy the Heck" out of it! I'd like to see it. Can you post a pic? Your own observatory? I have done the same thing and the Questar where it really matters has the better optics. Besides the obvious smoothness of figure in the star test the Q's optics are aspherized. I've done a few double-pass auto-collimation tests and the difference is obvious. The ETX is good but it will never be a Questar. The wonderful thing about the world is that most people are happy with their $600 telescopes and others with their $6000 telescopes. Same for $10 wine and $100 wine. $150 hotel rooms and $1500 hotel rooms. (Don’t get me started on ladies’ handbags). Congrats on the new Q. You have joined a very select family! Hope that it brings you much observing joy.